We've had our eye on this book for a long time. Charlotte, because "Jack and the Beanstalk" is one of her favourite fairy stories, and she can't resist re-tellings of this classic tale. Me, because I'm completely in love with the warm fuzzy 40s/50s Americana type of artwork that Colin Stimpson and quite a few other children's illustrators are so expert at working into brilliant children's books. 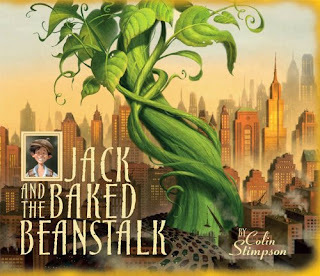 The story opens with Jack and his mum running a successful snack van in the busy heart of a huge sprawling metropolis. People come from miles around to sample their delicious burgers, fantastic fries and damned fine coffee. But changes are afoot, the city is undergoing huge growth and soon a flyover is planned - that will mean folk will bypass Jack and his mum's snack van completely. For a while things aren't too bad as the builders and construction crews bring regular business in until the flyover is complete. But then, once it's done, no one comes around any more - and Jack and his mum get down to their last few pennies. Mum gives Jack the money and tells him to go and pick up some coffee and bread, after all people might still want to stop by for a breakfast or something. But a mysterious old man convinces Jack that he'd be better off spending his money on a magical can of baked beans instead. Jack knows the classic fairy story just as you do, and when he gets home he's disappointed to find that mum has no faith in the old legends, and throws the tin of baked beans out of the window (where it bursts, scattering juicy beans all over the place). What happens the next morning? 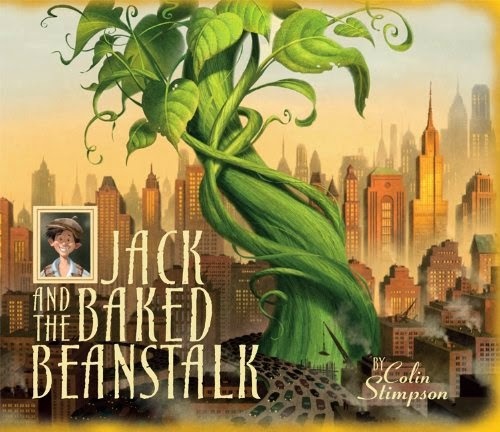 You've guessed it - a giant baked beanstalk springs up, and not only is it covered in a gorgeous crop of the best beans Jack has ever tasted, the beanstalk snakes up into the sky leading to...fortune and glory perhaps? What Jack finds at the top of the beanstalk after a hearty beany breakfast, we'll leave for you to discover. There is a giant but he's not the sort of evil fellow who will grind your bones to make his bread. There is a hen that lays golden eggs, but instead of a harp you'll find something a bit more swinging. OK no more spoilers. As I said at the top of this review we've been hoping we'd get a copy of this - but our library came up trumps instead and we've been wrapped up in this fantastic tale ever since. Colin has produced a brilliant version of the old story, updated with a kicking 40s / 50s vibe. The art is simply stunning (if there's one thing you can rest assured of with Templar, it's that they really do attract the best author-illustrators in the business) and I'm actually thankful that, for once, here's a book about baked beans that spares us all that parping and windy nonsense that usually accompany any kids book where the delectable tinned side order features heavily. I'm now on a mission to track down anything else Colin Stimpson has done, and we'll be picking up our own copy of this book as soon as we can. It's utterly fantastic. Charlotte's best bit: The world's biggest and tastiest looking omelette - so good in fact that you could almost live in it! Tara Books have reissued a real classic, a fantastic animal book that has a fairly simple story with simple artwork - but with so many brilliant little moments both heartwarming and delightful that make us glad it's coming back to bookshelves. 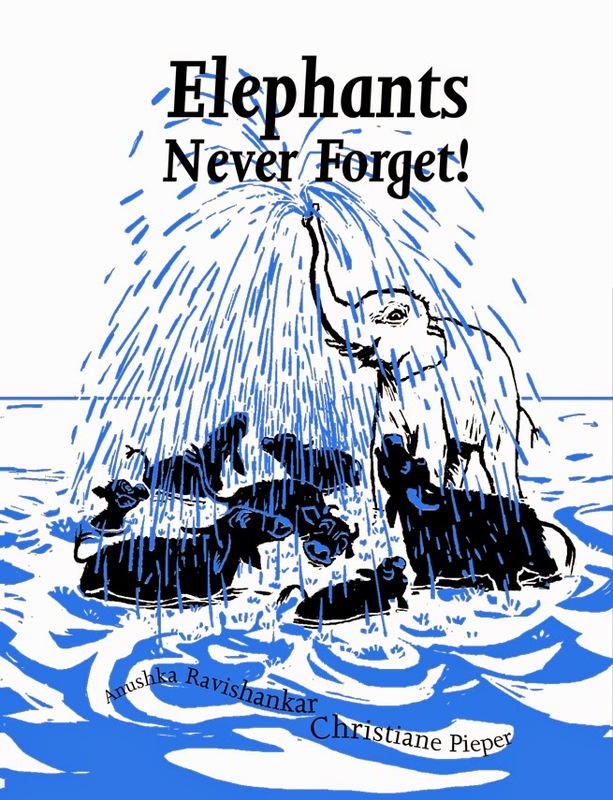 "Elephants Never Forget" is a fish out of water (or is that "Elephant out of Drinking Hole") tale of a baby elephant who ends up separated from his tribe. Left all alone in the hot sun, poor baby elephant doesn't have much of a chance of survival, but he's no dumbo, he manages to find the most unlikely allies. The buffalo love Elephant and his 'joie de vivre'. The young buffalos especially love the fact that elephant loves to play, particularly in the mud and water. Look at his face! Now that's an elephant who LOVES having fun! As elephant grows bigger and stronger, he becomes such an important member of the buffalo tribe that they are inseparable. He defends them against attack by the nasty tiger, he showers them every morning to keep the ticks at bay - and he's still the best playmate in the world. But what will happen when elephant once again meets his own kind? Will he choose to stay with the buffalo or will he go back? Anushka's rhymes are wonderfully sing-song (she is described as India's "Dr Seuss" which is definitely apt). 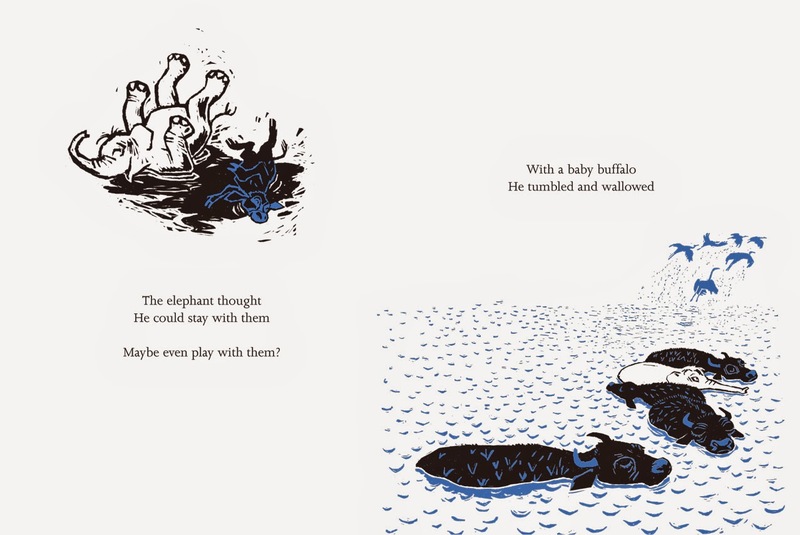 Christine Pieper's illustrations look like fairly simple line work but she has an astonishing knack for imbuing her characters with flowing movement and the most wonderful expressions (we can't get over how funny some of elephant's faces are when he's having fun). It doesn't get any better than having a good wallow in the mud! 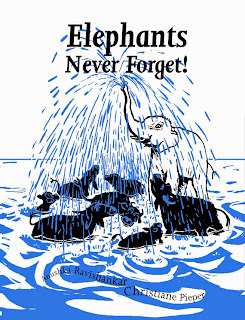 "Elephants Never Forget" is reprinted on 1st June 2014. Like everything Tara publish, it's nigh-on unmissable! Charlotte's best bit: Elephant wallowing with lots of baby buffalos using his tummy as a trampoline! Daddy's Favourite bit: An entertaining story, fabulously told with flowing rhymes and a really heartwarming end. Loved the artwork too, it's brilliant and simple. We read so many news items, and hear so many book folk complaining that there aren't enough engaging non-fiction books around for children of a certain age. It is extremely difficult to find history books that don't dilly-dally down the path of presenting history in the "Horrible Histories" style, where often the fine details are lost under a barrage of fart and poo jokes. It's also difficult to find history books that can engage a child's curiosity and thirst for knowledge while keeping them entertained at the same time. We've borrowed quite a few books in the Franklin Watts range from our local library, and we've always found them really fantastic whatever the subject. 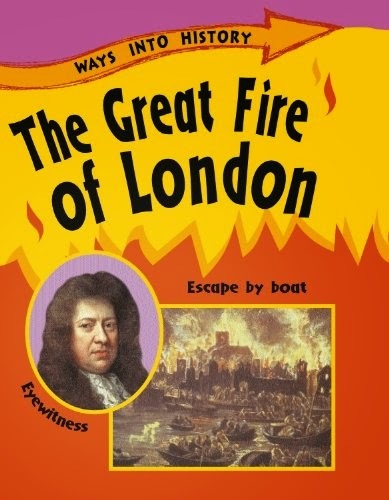 With Charlotte's current new 'hero' being Samuel Pepys (a fact she proudly presented to her teacher this week - proud dad moment) she grabbed this book about The Great Fire of London in our library trawl. Sally Hewitt has gathered together a huge collection of resources, and performed the minor miracle of squeezing them into a book. Following on from our excellent experience reading all about the plague, we thought we'd better find out what happened when fire broke out in Pudding Lane in 1666, and quickly spread throughout the city. Miraculously only 6 people died in the fire, but the loss of property and personal belongings was colossal, and many folk were forced to escape on the stinking River Thames as fire spread. We thoroughly recommend the Franklin Watts range, they're not too 'Schooly' and this is a particularly brilliant example of what they do. Charlotte's best bit: Learning all about how Londoners fought the fire with hand pumps and huge heavy leather buckets. Quite a contrast to what we'd use today to fight fires. 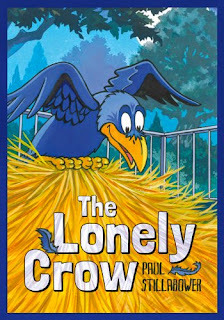 This indie-published title popped through our letterbox unannounced and though we usually get a bit grumpy about unsolicited books, we couldn't really be grumpy about "The Lonely Crow" by Paul Stillabower. Ex-banker Paul has turned his talents to writing a rather touching and heartwarming story about a crow looking for somewhere safe to roost for the night. His wings are tired, his legs are old, and he just wants to find that warm snuggly spot to get a few hours sleep before the first rays of morning appear. It's not as easy as it sounds, finding somewhere to sleep in the sprawling metropolis but flying over Regents Park, the lonely crow spies a nest. Unfortunately a rather rude (and quite menacing) owl is already there, and does not take kindly to a crow crashing in on his pad. Poor crow is forced to look elsewhere. Surely there'll be somewhere safe to sleep at London Zoo? 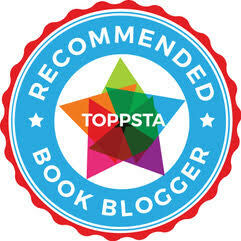 Charlotte's best bit: A lovely heartwarming end - which we'll keep quiet about, go read it and find out what happens! 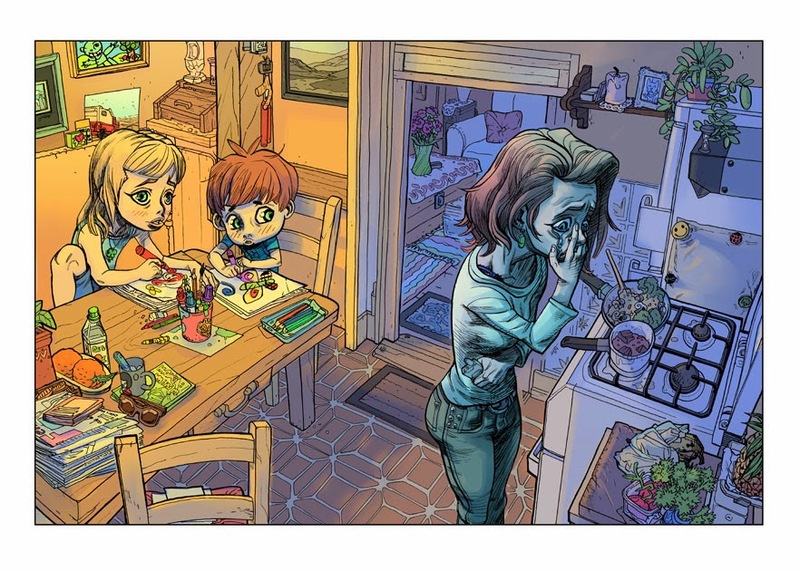 Daddy's Favourite bit: Really nicely written, great illustrations, an indie treat! I can imagine what it must've been like for Dom Conlon as a kid. Born around the time when space still held infinite possibilities, when NASA were still sending gallant astronauts into space, before the Space Shuttle gave us a glimpse of the sort of space exploration we'd all dreamed about or seen in science fiction movies. It's a very different world now and Dom's one man mission is to make sure that children today don't forget that space is out there, and hopefully one day they might even get to rocket out to the stars themselves. Kids absorb poetry like hungry little sponges so it's with great pleasure that we read Dom's poetry anthology where he brings together his love of writing with his love of space, in a brilliant collection that travels around our solar system and beyond. Dom creates a poem for the stars, for the planets we know, with his trademark humour and wistful wonderings - what if any of us were given the chance to explore space, how would it affect us and what would we write about it? Charlotte loves poetry - not because we push it on her, but because poems and rhymes exude a cleverness with the language that kids actually admire, and then most deliciously, begin to want to emulate. Sometimes it's fun just to hear Charlotte speaking in rhyme and as her vocabulary expands from the tons of books we consume every week, her rhymes become more complex. Inspiration comes from many places, and we really loved Dom's collection - as we're complete space nuts ourselves. Charlotte loved the poem about Mars, blushing with embarrassment from the huge cosmic joke of fooling us into believing that one of our nearest neighbours was crawling with little green men. I had many favourites but loved the homage to astronauts, and the imagery of Saturn spinning on its eternal potter's wheel. Jools Wilson's brilliant illustrations are a perfect fit for the collection too (and of course kids can more readily absorb a poetry anthology if there are fantastic pics to go along with it). To further inspire kids, Dom has come up with a collection of activities and ideas for ways to explore space from the comfort of your own living room. "Astro Poetica" as a digital download received some rave reviews, but we're strictly old school and the delight of actually being able to read tangible copies of Dom's work is a bit of a treat. Charlotte's best bit: Mars - red and blushing. Book House / Salarya's brilliant history series is now one of Charlotte's favourite non fiction ranges and when we spotted one of the "Danger Zone" books in our local library, we had to nab it. 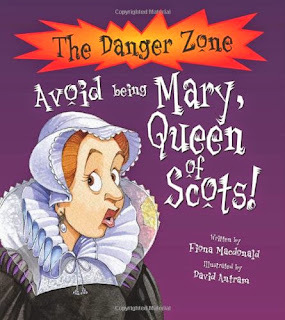 With a chance to learn all about Mary, Queen of Scots, Charlotte was wrapped up in this book from the moment we got home. Charting Mary's life from childhood right through to exile, failed marriages and enough plots and intrigue to make the average episode of Game of Thrones look like an episode of Coronation Street, this book is a fantastic and fascinating resource. David Antram's humorous illustrations make it extremely accessible for Charlotte's age group, and this particularly turbulent period of history is fascinating to her (she has previously enjoyed Salariya's fantastic book charting the perils of being married to Henry VIII. One of the most tragic characters in royal history, poor Mary! Daddy's Favourite bit: Book House / Salariya really do know how to put together a fascinating and engaging non-fiction range for kids. We must seek out more in the Danger Zone series. Alan Snow's brilliant "How (things) Really Work" books have always been well received by Charlotte. None more so than this absolutely brilliant edition, looking into the inner workings of characters that children (both boys and girls) absolutely cannot resist. Pirates. We're talking about pirates. Long, short, beardy and female, they're all covered here in exquisite detail using Alan's trademark touch for humorous illustration and great little speech bubbles in each page spread. There is 'avast' (ha, get it? Avast, me hearties!) 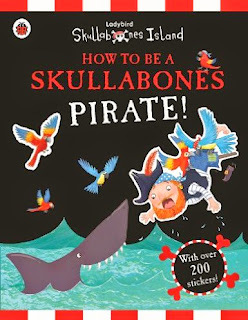 list of books that are nigh-on essential for your pirate-obsessed little 'uns, and this joins the ranks of the biggest and best. Here's a bit of silliness that we couldn't resist. You will probably remember the scene in "Despicable Me" where Gru is reading to his new "adoptees" while they're playing up and blatantly not sleeping at bedtime until they've heard a story. 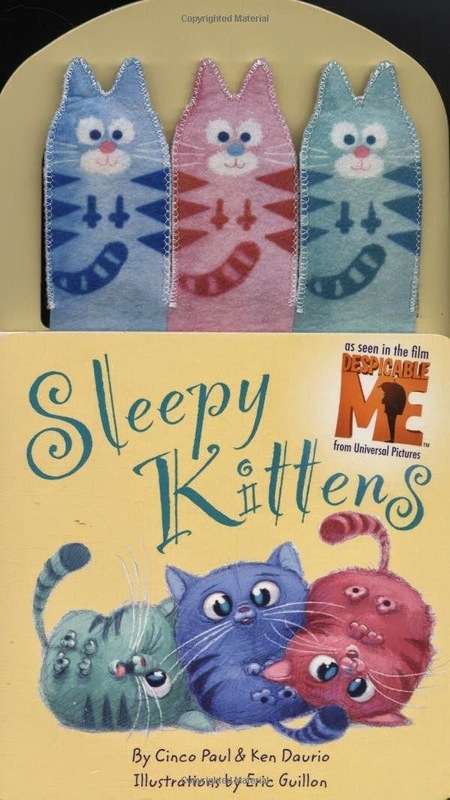 Gru comes up with this little masterpiece, a book with finger puppets - the three sleepy kittens. A book was released not long after the original movie, and since then the book has been in and out of print a few times. With the resurgence of popularity in all things minion-shaped (and the release of Despicable Me 2) you can now obtain the book once again without paying those ridiculously exorbitant Ebay and Amazon prices. Only...well here's a note of caution. If you have tiny babies, and they're just starting to show an interest in sitting on your lap while you read books - this is a brilliant little idea. You slide your fingers into the 'kitten' shapes on the book, and wiggle them around while telling the story of three sleepy kittens going about their daily business. The quality of the book is pretty variable though. Cheap quality nylon kitties don't quite look as great as the ones in the movie, and although the illustrations are great, it's a bit of a bust for a six year old who loves the movie but isn't really at the stage of being entertained by daddy reading a 5 page story while wiggling his fingers around inside three bland looking puppets. Daddy's Favourite bit: Even with my best Gru impression (which is a fairly easy thing for me to do, by the way, I certainly have the hairstyle for it) I couldn't really entertain Charlotte with this one - But it'll definitely be something to try out on my new niece in Cornwall next time we're visiting. 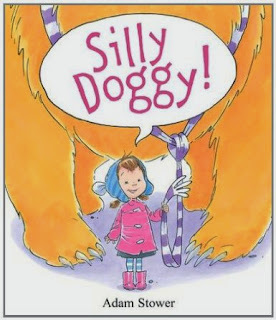 Adam Stower, the genius behind one of our favourite books of the last few years, the sublime "Troll and the Oliver", preceded his troll tale with this story of a little girl and her...er...her dog. This is a tough review to write because we don't really want to give away too much, but do want to tell you how hilarious the central theme of this story is. Dealing with children's perceptions of the world around them (and the animals in it) and that mania for owning a pet that all children possess for the early parts of their lives (when mummy and daddy do all the feeding, cleaning up, training and mucky stuff while children breeze in and tickle their beloved dog or cat behind the ears). Lily (the girl in our story) finds 'Doggy' wandering around and decides to adopt him. But is Doggy quite what he seems? Doggy certainly doesn't seem that keen on all the things doggies usually love. What on earth is wrong with him? And why is he so...big! Daddy's Favourite bit: Adam Stower excels at producing children's stories with a twist in them, and this is no exception. It's brilliant! Have you met Maisie Mae yet? We've been taking a look at Poppy Harper and Clare Elsom's book series from L & B Kids and we think it's high time that Dennis the Menace moved over, Roger the Dodger disappeared and Horrible Henry took a hike - Maisie Mae is taking over! 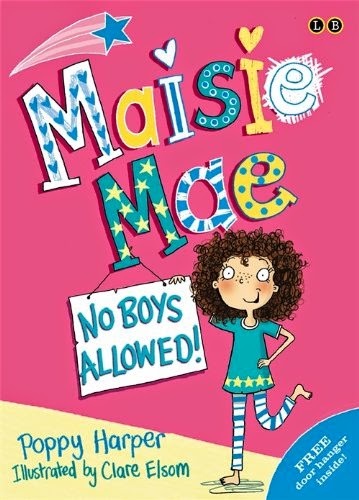 "Maisie Mae: No Boys Allowed" is already available, but there are two further Maisie Mae adventures scheduled for release over the summer, to keep your little bookworms busy. 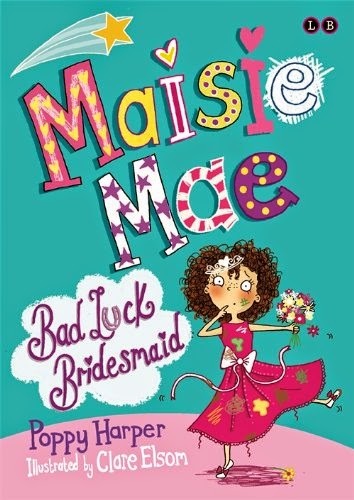 Find out what happens when Maisie Mae gets dressed up for a wedding in "Maisie Mae: Bad Luck Bridesmaid" which is due for release on 19th June 2014. As you'd expect, things aren't going to go smoothly when you've got the world's naughtiest girl being dressed up in a lovely pretty bridesmaid dress - which won't stay pretty for very long. Here's one with a sentiment I definitely identify with...! Maisie is off on a camping trip to France - and Maisie (like me) really does not like Camping, and is determined to derail the holiday! Goodness me, poo really doesn't ever go out of fashion in children's books does it! 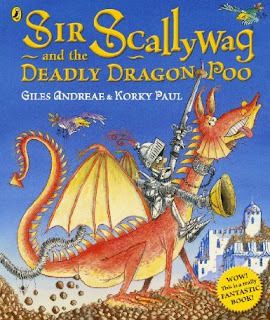 Here's the brilliant sequel to "Sir Scallywag and the Golden Underpants" which was released back in 2012. Back again are the dream team of Giles (can rhyme his way out of a concrete overcoat) Andreae and Korky (Has scratch pen, will travel!) Paul with another adventure for the brave but slightly scatterbrained knight, Sir Scallywag. King Colin and his Queen are rich beyond their wildest dreams, and spend all their lovely loot on sweeties (amazingly, they have lovely teeth considering how much sugary stuff they cram in). But trouble is on the horizon. As the King, Queen and all their royal subject get fatter and lazier, The dreaded Baron Greedyguts hatches a plan to steal the King and Queen's amazing sweetie-making machine. A plan so dastardly and foul that we can barely bring ourselves to type it. The Baron will use deadly stinky dragon poo to lay siege to the King and Queen's castle, forcing them to give up the goodies! Sir Scallywag, brave knight and the only one who hasn't stuffed his face full of sweetie goodness, must come to the rescue once again - Braving torrents of dragon doo-doo to turn things around just in time for a slap-up feast around the banqueting table. But can Sir Scallywag brave such a dirty rotten campaign and defeat the Baron before it's too late? We'll leave you to discover the answer. Normally we are pretty fussy about poo-based books (yes, OK, we'll admit it, we do snigger at the odd one or two though). This is brilliant though and if your kids are going through a phase of loving tales of knights of old, brave and bold, they are absolutely going to love this to bits. "Sir Scallywag and the Deadly Dragon Poo" is out on the 5th June 2014. Reserve your copy now from Picture Puffin. Charlotte's best bit: The sweetie machine looks so yummy, but a certain cameo by a bewhiskered hero really made her day! Daddy's Favourite bit: Children's picture books truly don't get much better than this, it's fun, hilarious, beautifully illustrated, has the tightest and most accomplished rhymes - and even if you're not a huge fan of poo, you will love this! My little history girl loves delving into non-fiction books (in fact it's getting very very difficult to get her to pick up story books in our bi-weekly library visits). The National Archives series from A & C Black are just the sort of book that she can lose hours to, even if the subject is a bit...icky perhaps? When we visited The Museum of London, Charlotte was rather morbidly fascinated by the museum's amazing section on the Great Plague of London in 1665 and the catastrophic effect it had on the capital. Nick Hunter's book, ripe with brilliant original paintings and illustrations from the era (some rather grim - definitely not a book to read while scoffing your breakfast, Charlotte!) digs right down into the cause of the plague, the strategies that people in power employed to try and offset the devastating effects of the plague, and the huge impact the disease had on Londoners. This is a thoroughly absorbing book that really does sift through every detail, from the symptoms of the disease, to the amazing beaked suits that doctors would wear to try and ward off the pestilence. As I mentioned, it's a bit of a morbid subject for my princess-loving little girl, but to see the fire of curiosity kindled in her eyes when she reads stuff like this really makes me one proud daddy. Love my history girl to bits! Charlotte's best bit: Reading all about the sometimes dangerous and often daft cures that 'quacks' at the time would prescribe to ward off the sickness. 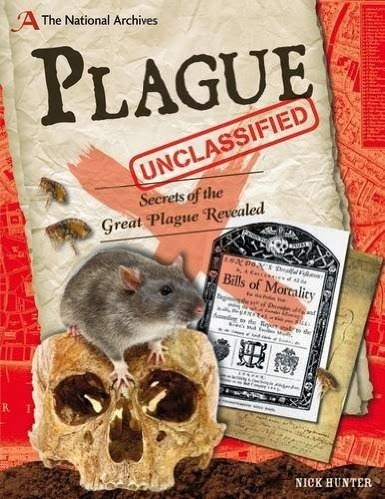 Daddy's Favourite bit: Detailed, and brilliantly compiled account of one of the worst outbreaks of plague ever recorded. Fascinating, quite gory in places but an amazing book for completely absorbing Charlotte in a huge chunk of history. I remember when we first encountered "The Phlunk" - and it took us quite a few re-readings to get used to the rhythms of the book when read aloud. 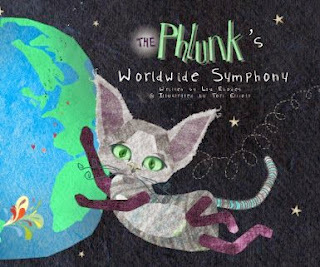 Now a year on we're looking at "the Phlunk's Worldwide Symphony" and it's such a lovely and approachable book which we took to instantly. Music, listening to music, playing music (alright, we're not that talented but enthusiasm and fun are worth ten times more than mad skills on the trombone, surely?) and more importantly, the recognition that different countries and cultures all around the world have amazingly diverse and fabulous approaches to musical enjoyment. We meet, once again, The Phlunk - that crazy Aye-Aye-Esque creature who lives on a strange shaped planet. Tuning in to the rhythms of the world, The Phlunk loves hearing the children of the world as they play their favourite instruments, tooting, thumping, twanking and plinky-plonking all sorts of wonderful instruments. Lou Rhodes' rhymes flow really wonderfully this time around, and we loved Tori's artwork (particularly the children enjoying a rhythmic riot of sound). "The Phlunk's Worldiwde Symphony" is out today from Lou Rhodes and Tori Elliott, published by Strata Books. Daddy's Favourite bit: A fantastic fun book to read aloud, with lovely rhythmic flow. He's a major superstar, he blitzed Britain's Got Talent with his owner Ashleigh, he loves sausages and he's about to muscle in on Lassie by starring in his own movie? Who on earth are we talking about? 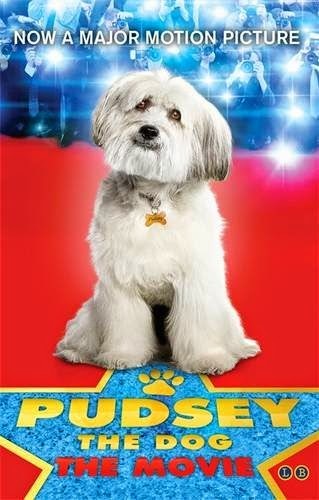 Why, Pudsey of course, the Border Bichon Frise cross who has already graced our TVs, and is about to hit the silver screen for the first time. We were fortunate enough to take a look at Pudsey's new book that's releasing along with the movie, a novelisation of Pudsey's first big screen adventure that sees Pudsey moving to the country and using all his skills to cope with country life. Fighting off unscrupulous land developers, and scoffing as many venison sausages as he can snaffle along the way, it's going to win over any fans of this talented pooch. "Pudsey the Dog: The Movie" book is out in paperback, from L & B on June 5th 2014. Reserve your copy now! Have you ever wondered what goes through your moggy's mind on a daily basis? An obsession with sleep, the sound of the tin opener, perhaps even scurrying mice gnawing and nibbling in the night? 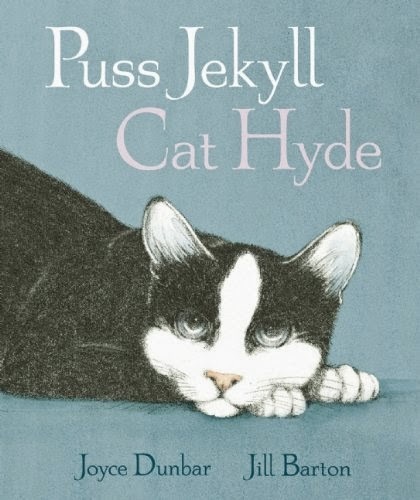 Joyce Dunbar's fascinating light and dark look at feline behaviour in Puss Jekyll, Cat Hyde deliciously shows the contrasts in cat behaviour with every turn of the page. On one hand you have Puss Jekyll who curls up, purring in your lap and nuzzles for a cuddle. On the other hand you have the fearless semi-wild stalker of rodents and birds, who brings in lovely presents from the garden for your delectation. Charlotte read this out to me with glee and delight. Joyce Dunbar's writing style is poetic, sometimes dreamy and yet when we're examining puss's dark behaviour, it's quite terrifying and menacing too! Eek! All in all it perfectly encapsulates the dual personality that cat owners know their pets possess. Wonderful. Charlotte's best bit: Cat stalking a poor little unsuspecting vole. I bet you can guess what happens next! Daddy's Favourite bit: This is excellent fun to read aloud, shifting from a lilting poetic and dreamy style to a stark, jarring dark style as you make your way through the book and encounter the many facets of feline behaviour. 3) You're going to be on the receiving end of a big, sloppy, smoochy, lipsticky wet kiss! YUCK!! 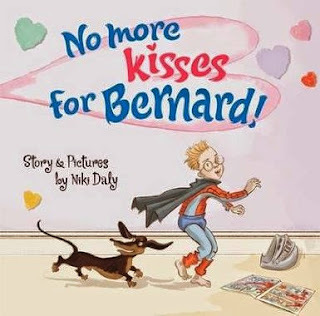 It's an occupational hazard for a kid, and we absolutely loved Niki Daly's hilarious story about Bernard and his over-affectionate aunts. They cannot resist Bernard because he's so cute and adorable, but Bernard really could do without all the gross attention. On Bernard's birthday things come to a head, and then the final straw - Bernard puts his foot down and boldly proclaims "NO MORE KISSES!" His aunts are upset, and one really doesn't take Bernard seriously. There's upset and wailing, but Bernard is determined to stick to his guns. Or is he? We'll see! This story is fun and entertaining, and it's made me think twice about giving Charlotte a big soppy wet (and probably quite stubbly) kiss on the cheek as I'm tucking her up at bedtime. Maybe just a tiny one. (peck). Charlotte's best bit: Bernard's aunties are lovely really, but even Charlotte drew the line at one with her triple-thick lipstick! Eeek! Daddy's Favourite bit: This book brought back harrowing memories of being made to kiss (toothless) gransch, who chainsmoked and had a wispy tickly beard. AIIEEE! We've been on the look-out for books that deal with difficulties at school. From time to time, Charlotte gets very teary-eyed in the morning and although she absolutely loves school, we're completely at a loss to figure out why some mornings are more difficult than others. In our library trawl, we found this book - and although it doesn't deal with Charlotte's problem (which is that she gets quite homesick, and after a weekend - or a school holiday - where she's been with us or her grandparents, she can get quite nervous and agitated when it's time to settle down for a new school day) it does deal with a hugely important problem some children may face. Dyslexia can often go undiagnosed, and it's extremely difficult to find advice or books that tackle this tricky and sensitive issue. 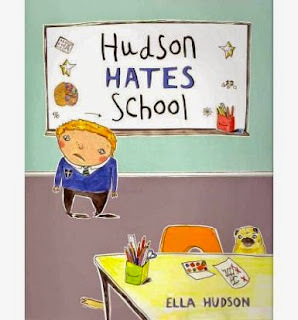 Ella Hudson's "Hudson Hates School" stars a young boy who really, truly hates school. He isn't very good at tests, but in most other subjects he is fantastic. It takes an observant teacher to get to the root of the problem and soon Hudson receives special care and attention, and finds new ways to make learning more fun. Ella's story is beautifully written and illustrated, and Hudson is a character that girls and boys can readily identify with. This is hugely important as there will undoubtedly be children they'll encounter in life and at school that will have dyslexia (Charlotte's uncle and auntie have it, and this book has helped us explain Dyslexia to her in terms she can easily understand). Daddy's Favourite bit: Really excellent story and it's great to know that there are books like this out there, that deal with a tricky and sensitive subject so expertly. 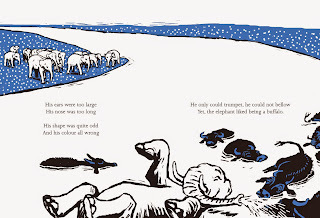 Wordless picture books sometimes lead me into a real performance whenever we receive one and start to 'read' through it. 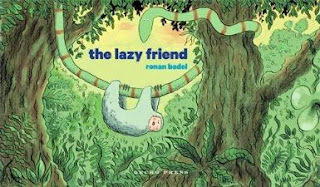 Ronan Badel's "The Lazy Friend" features the animal du jour, everyone's current favourite jungle layabout The Sloth. Sloths are actually pretty fascinating characters (anyone who tries to spot the sloths that live in the hothouse at Cotswold Wildlife Park had better be observant). So they're a brilliant subject for a knockabout tale such as this. Sloth is asleep (quelle surprise!) while his friends play cards. Seemingly nothing can wake Sloth from his slumber, which causes problems when a logging company move in on his habitat and hack down the tree that sloth has attached himself to. Poor snake is frazzled, but is sloth OK? We'll leave you to pick up this fabulous book and find out the answer for yourself (the end of the book is very funny indeed!). Wordless picture books are extremely important for children who aren't confident readers, but want to join in with telling a story. Based purely on the lovely visuals in this, they'll have no trouble at all having fun and describing each scene just as we did. "The Lazy Friend" by Ronan Badel is out on June 1st from Gecko Press. Charlotte's best bit: Snake is extremely good at hiding from the nasty logger! Daddy's Favourite bit: A lovely example of a wordless tale that has a ton of atmosphere, engagement and above all, loads of fun! My lovely other half is such a huge fan of "A Streetcat named Bob" by James Bowen - that I thought I'd hand over the reins and let her take over for this week's Book of the Week. So take it away StrollingMum! I've been given the chance to take over read it daddy's blog for one post, nothing to do with days out but because of a lovely cat book. My name is Bob landed on the door step and the moment readitdaddy saw it he knew I had to be the first to get my paws on it (sorry), as a few years ago my mum loaned me "A Streetcat Named Bob" and I loved it. if you had read the original book) but it draws on the point of two lost souls finding each other at just the right time in their lives. The rest of the story summaries the paperback book into a few pages of James nursing Bob back to health (which Charlotte thought was lovely and she loved the art work that went with this) and how they go about their days together. Near the back are some lovely photos of James and Bob busking together and on the last page is a short summary about James and Bob for those who wish to know a little more about their touching story. on the back. I think Grandma is going to enjoy looking at this book too. Charlotte's best bit: When Bob is hurt but James is making him better, also the picture of Bob in his tuxedo. 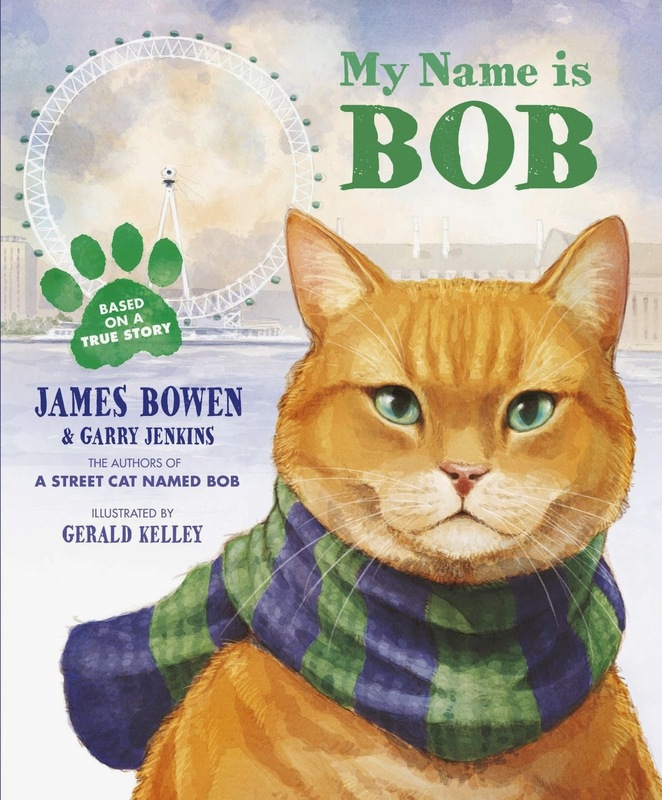 Mummy's Favourite bit: The way the book introduces homelessness in a way that adults would probably pick up on but not younger children, explaining how Bob is homeless through no fault of his own, how lonely life is and how you struggle to make friends. Abie Longstaff's stories draw on classic fairy tale characters and nursery rhymes, splicing the two together to create an exciting story world that has huge appeal to little girls like Charlotte who can't get enough of fairytale adventures. This tale is centred around Snow White. 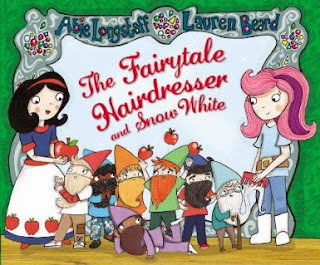 When a magical mirror is found and brought to the salon, the Fairytale Hairdresser finds out that Snow White is still in danger from the wicked queen, and it's up to her to come up with a cunning plan to ensure that Snow White is kept safe. But with a love of apples, and even with a disguise, Snow White still falls foul of the queen. Is it too late to save her? Or can a handsome fairytale doctor lend a hand? Charlotte loved this tale, in her own words "I love how all the characters are all together in the story and all have adventures together". Charlotte's best bit: Finding and spotting all the different characters from nursery rhymes and fairy stories all dotted throughout the tale. Daddy's Favourite bit: A neat idea to draw on a huge back catalogue of characters and stories and mix them all together. Very girly and sparkly. Most boys (and, er, dads!) will run a mile, alas! 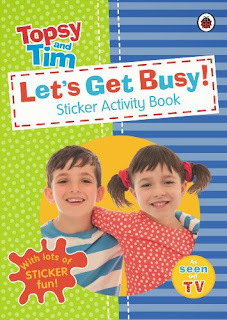 Topsy and Tim - Let's Get Busy! Did you know that Topsy and Tim, beloved booky brother and sister have made the leap from books to the small screen? They have indeed and we were slightly surprised by the news - we don't watch TV Y'see, so we tend to miss these things. Topsy and Tim are stars of a new range of Ladybird Activity Books to compliment the series. See what the siblings get up to in "Topsy and Tim: Let's Get Busy! ", a fun activity book with lots of opportunity for colouring, stickers, word searches and dot to dot puzzles. Full of colour illustrations and photos, even mum and dad get in on the act along with Topsy and Tim's awesome dog Mossy (who usually manages to get into more mischief than the twins themselves). Join in the fun with the book range, available from Ladybird Books. Charlotte's best bit: A rather tricky word search, and lots of colourful stickers to play with. Daddy's Favourite bit: A neat little book filled with cool stuff to do. Perfect for the rotten weather we've been having lately! They're probably amongst the most enduring characters in children's books, so what is it that draws children to pirates? Is it because they basically get away with being extremely naughty all day every day? Quite possibly so! Meet the Skullabones Island pirates, a hearty gang of scoundrels with hearts of gold, who love nothing better than sailing the seven seas in search of treasure. 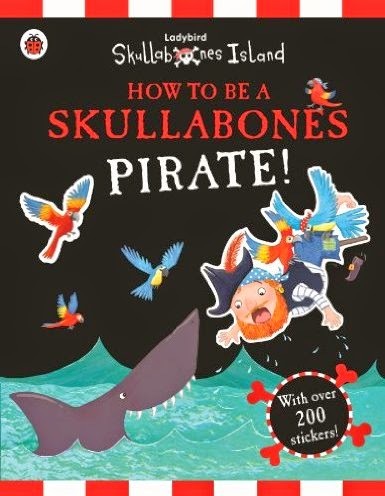 In this sticker and activity book you will learn the way of the pirate, the Skullabones Pirate at that - and engage in lots of brilliant puzzles and activities, with ace colouring and sticker scenes to introduce you to Captain Cutlass and his motley crew. Lots of fun for girls and boys who love all things piratical. Charlotte's best bit: Observation puzzles with the awesome girl pirate! 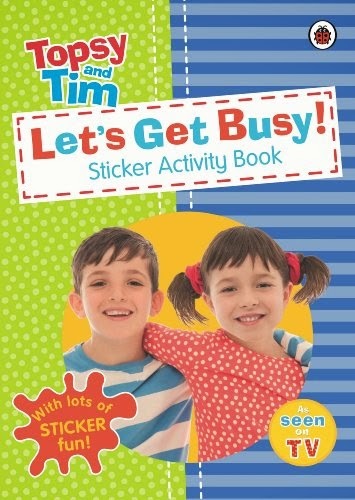 Daddy's Favourite bit: Fun and engaging activities, and a ton of stickers to keep little ones amused for hours. It's wonderful to see this fantastic book getting a lovely 20th Anniversary polish. One of the best dinosaur books out there, "Dinosaur Roar!" is a brilliant 'join in' book for younger readers who will love the big bold and colourful illustrations, and the low word count with lots of opportunities for enthusiastic audience participation! 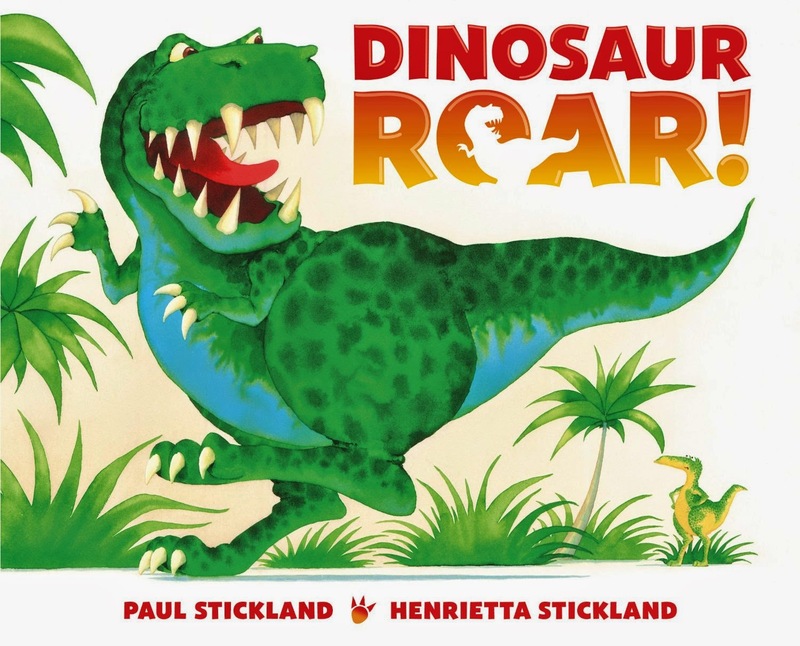 Henriette and Paul Stickland's book is one we often spot in the library, each and every copy is well loved (and very well worn) and that's always a great sign that it's hugely popular. 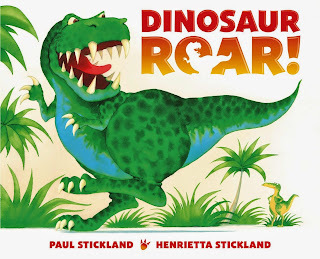 We enjoyed reading through this together, Charlotte supplying the roars, squeaks and grunts of the various dino species inside - and I enjoyed laughing my socks off at her impression of a Triceratops. Daddy's Favourite bit: Bold and colourful, big and noisy, a wonderfully satisfying book celebrating its 20th Anniversary with this awesome edition! So far we've been immune to the scatological charms of this well known dinosaur and his equally well known creators. 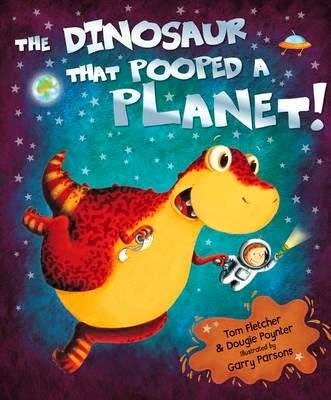 Tom and Dougie from McFly created a poop-fuelled yuletide classic in "The Dinosaur that Pooped Christmas" (Which we still haven't read) but we're catching up with them as they head into space. Along with talented illustrator Garry Parsons, they find out what happens when young Danny get up to mischief when they visit the science museum. They hijack a rocket and soon they're jetting off into the inky blackness of space! (Charlotte kept pointing out how naughty Danny and Dinosaur were for stealing exhibits from the museum and misusing them. I did point out that it's a 'boy' thing but she was unconvinced). In their haste to explore outer space, Danny and Dinosaur forget their lunches - and soon Dinosaur's tummy is rumbling. With nothing around to eat, Dinosaur picks the nearest thing to satisfy his humungous appetite - the spaceship! Eeek! Can Danny and Dino make it back home for tea? Or will Dino's huge appetite and equally huge bottom mean serious trouble for the milky way? Charlotte lapped this book up and I'd imagine a huge amount of kids her age would. There's just something about it that really switches me off. Don't get me wrong, I think Tom, Dougie and Garry are fantastic talented folk but I just couldn't really get past the book's core draw. Dino poo. Having only read this book, I can't comment on the more festive version - and a quick glance at Amazon suggests that there are more dino-poop-fests on the way (The Dinosaur that Pooped the Past is on its way in September 2014). As ever with books we disagree on though, the sound of Charlotte snorting with laughter at any book (even if I don't like it) is one of the best sounds in the world, so I'm willing to read it with her whenever she asks. Daddy's Favourite bit: Some nice Seuss-ian rhyming going on but I had little stomach for the brown stuff later in the book! Ew! Every time we hear that Emma Yarlett has produced a new book, or is illustrating someone else's stories, we get a little over-excited. Charlotte is a huge fan of Emma's - because her artwork is always gorgeously detailed, there's always a necessity to read her books again and again and again so you don't miss anything, and her stories are deftly woven to inspire and delight. 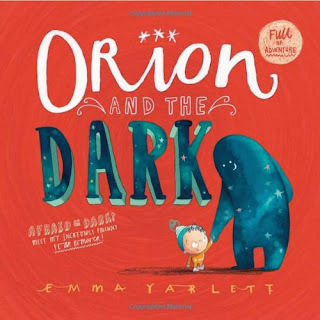 "Orion and the Dark" deals with a theme we have seen several times before, and looking back through the blog it's a theme that seems to consistently feature in books that end up as our "Book of the Week" nominees. Children's fear of the dark can be a very real fear - and a problem for parents who want to make sure that their child feels safe in their environment, and also get a good night's sleep so they're not complete grumpy-chops in the morning. Most recently we absolutely loved "The Dark" by Lemony Snicket and Jon Klassen, and Emma Yarlett's tale adopts a similar theme, but approaches things in a fresh and engaging way. Orion (coolest name ever!) is a little lad who has many fears, not just of the dark. Darkness is the worst though, and Orion hates all the spaces in the house that are dark (like under the bed and inside the wardrobe). Poor Orion's imagination works overtime and he gets into a real lather. One night, worse than all the others, something amazing happens. The dark comes to visit Orion but is the complete opposite of the nasty monstrous dark Orion was expecting. Thus unfolds a new chapter in Orion's tale, which we'll leave you to discover in this lovely book (lovely THICK book we should say, it's a really nice long story for a special treat when you want to send your children off to the land of nod with a belter of a tale). Emma's talent is that she engages children on two levels in her books, she wraps them up in an exciting and stimulating story, then engages their curiosity and observation with her beautiful illustrations. We mentioned at the top of the review how gorgeously detailed they are, and how Emma uses various media, collage and top-notch character work to give her stories a truckload of immersion and emotion. We've gushed enough. Simply put, go and buy this book. If your own children have their own fears about darkness and what lurks therein, this could be a really brilliant book to offer reassurance that the dark is nothing to be scared of - in fact sometimes the dark holds hidden wonders and amazement all of its own. Charlotte's best bit: There are some utterly brilliant spreads in this where elements of the page 'fold out' to describe the action in the story. Truly wonderful and such a brilliant idea to immerse children in the story and in books this way. Daddy's Favourite bit: For someone relatively new and fresh to children's books, Emma is fast becoming the safest pair of hands in the business for both illustration and storytelling duties. This is a theme we've seen before but Emma's take on it feels original and engaging from page one right through to the end. Novacarta's innovative 'A Story Your Way' kickstarter helps parents and children understand and cope with cancer. One of the best things about the whole "Kickstarter" phenomenon is that it helps some extremely important projects get a much needed boost. We have been contacted by Novacartawww.novacarta.org, who have put together some of the most innovative and amazing artists, authors and computer programmers to produce something truly original, an adaptable book - "A Story Your Way" that allows someone to set parameters to describe their own family unit, choose an art style and other items to tailor-make a book that can help convey an important story that follows their own experiences dealing with cancer. So many families would benefit from the book, and Novacarta obviously recognise the importance of ensuring that the deep customisation accurately reflects the modern family unit. 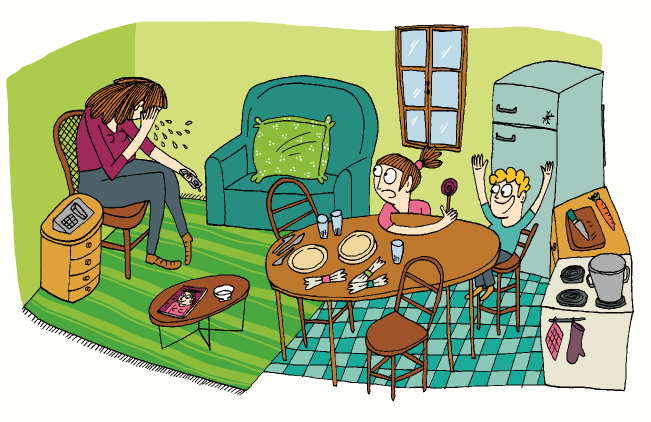 Explaining illness and its consequences to children is often a difficult and complex endeavour. A simple approach rarely reassures a child. It is therefore important to thematize the situation, the new daily routine and the specific changes the patient will go through. Studies done over the past 20 years show the importance, for children's well being, to include them in open discussions concerning a parent's illness. These studies explain that parents often find themselves lacking the appropriate means to have such discussions. The importance of openly communicating about a parental cancer with children is imperative for their well being. Children who receive clear information throughout the period of a parent's illness are less anxious than those that do not. For certain illnesses, like breast cancer for example, dedicated books exist to treat the subject matter with kids. However, these books focus on one specific case and moreover reflect a standard family structure. 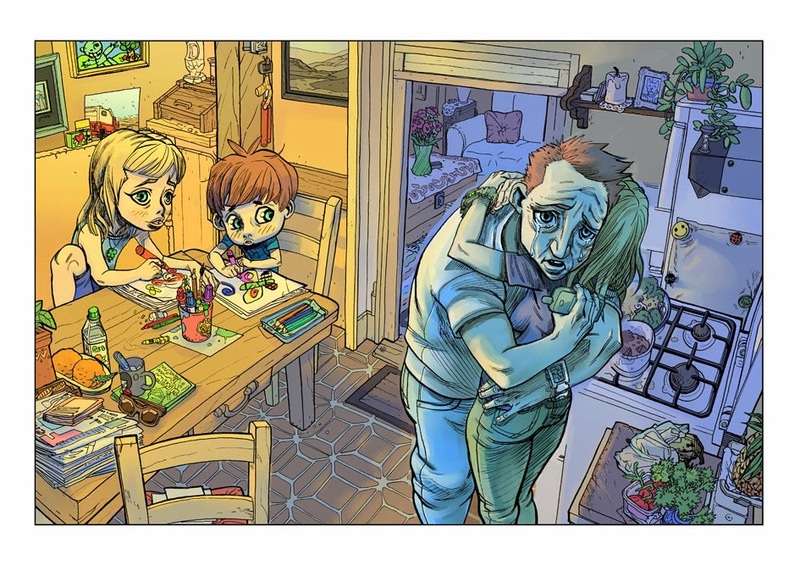 However, the heterosexual married couple with kids reflects an outdated family configuration. We know that in the United-States, 24 % of cancer patients have dependent children (the number goes as high as 33 % in the case of breast cancer). We can see that today children are growing up in families of many different configurations. Now, while these families may face discrimination in certain aspects of their lives, cancer doesn't discriminate and can unfortunately affect their lives. Our book can be adapted to all family structures and cancer types, so families that have as of yet not been represented in this type of literature can get a book they relate to. Novacarta will use the ease of print on demand technology to create individualised books. By preparing a multitude of scenarios covering the problems involved in cancer, Novacarta will select the appropriate ones for each patient, thus providing them with a story that best coincides with their specific situation. A semi-automatic work flow will print the book, on demand, for the patient and then delivered by mail. Please take a moment to visit the Novacarta kickstarter page and if you can, please pledge some money towards this amazing project. Also find Novacarta on Facebook too. Is 'different' good or bad? Do children grow up with an inbuilt sense when something's different or 'normal' and what is normal anyway? 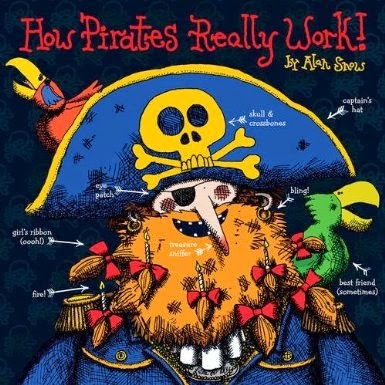 So many books have covered this tricky multi-layered subject in many different ways and here's a book that children will more readily identify with, picking out the core theme with ease and clarity. For a child, introduction to 'different' happens early on, so having books that celebrate, shout "Vive la difference!" is definitely a very good thing. Kathryn Cave and Chris Riddell have conjured up a world filled with fantastical creatures, though one is distinctly different from the others. Normally happy to live life in solitude, little "Something Else" is spurned by his peers whenever he tries to join in. Delightful and whimsical, a perfect pairing Kathryn and Chris with Kathryn's cool way with nonsensical words mixing into the story, and Chris's sublime illustrations. We've said it once and we'll say it again, "different is groovy, baby!" Charlotte's best bit: Aww Charlotte felt very sad for "Something Else" at first as he tried to fit in. 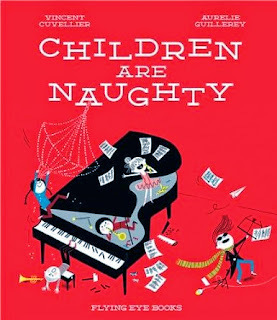 With a crazy chaotic story style, and visuals to match in that gorgeous "retro fantastic" illustration style so beloved of artists like Bob Staake and Chris Hitchins, "Children are Naughty" by Vincent Cuvellier and Aurelie Guillerey is a stark fire-engine-red warning tome designed to keep adults aware of just how naughty kids are. Got a prized possession you love more than anything else? Kids can probably trash it within a moment or two. Wondering who shaved the dog (or themselves?) Kids may act innocent, but they're likely to blame. With each page spread we see kids behaving badly, but in each and every case, the kids are having fun and enjoying themselves as kids do. What we loved about this was the very end of the book where you find out just where all that bad behaviour comes from, and how generations of adults will maintain that they were the pinnacle of perfection, blessed and well-behaved when they were kids but every now and again that mask slips with hilarious results. Loved this, it's energetic and fun! Charlotte's best bit: Kids invading the grand piano! Daddy's Favourite bit: loved that end spread with the family. Yep that actually happens when our lot gather together too! Books that celebrate children's endless curiosity always pique our interest. Curious Charlotte definitely identified with the little girl in this book for several reasons. 1) She does have a fairly messy room when she gets all her toys and books out and 2) She would definitely have pulled that piece of wool too...! A piece of wool? Yep that's how this story starts off, with a little girl called Little Lou and a solitary strand of yarn sticking out from a huge pile of toys. Little Lou wants to know what this wriggly fuzzy piece of wool is, so like most kids, she pulls it and soon unravels a HUGE WOOLLY MAMMOTH! 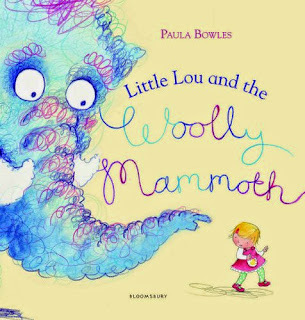 Now, as you'd expect, Little Lou is a little bit surprised and scared by this new blue (and huge) visitor, and isn't quite sure that a child's room is the right place for a huge woolly mammoth. But Mammoth has other ideas, and soon Little Lou finds that curiosity can be rewarded - sometimes with an amazing friendship that stretches to the moon and back, far longer than any random piece of wool. 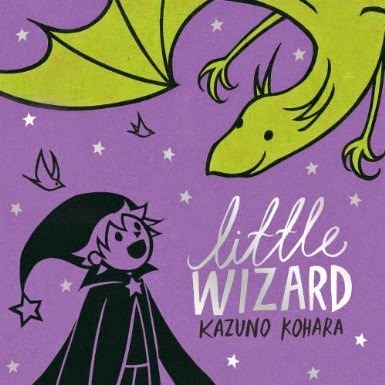 We love, love, LOVE Kazuno Kohara's books and we really love this awesome little tale of a young wizard and his new found friend. It reminded me a little of the brilliant "Meg and Mog" books with Kazuno's artwork kept simple but effective. Little Wizard is the only wizard at Wizard Academy who can't yet fly on his broom. Poor Little Wizard is left out of all the games and hi-jinks by the older children as they whizz off into the sky and have fun. One day, in a dark forest, Little Wizard meets a young dragon who becomes his best friend, and vows to teach Little Wizard the basics of how to fly, soar and swoop through the air (little dragon is a bit of an expert, you see). Trouble is on the horizon though. One day a brave knight appears, and vows to slay any dragons in the vicinity. Little Wizard must find a way to warn his friend, but can he reach Dragon in time to save the day? This is a really loveable and atmospheric little story, a nice easy read for youngsters who want to 'read it themselves' and striking artwork help it to stand out from many similar tales. A lovely story of friendship and believing in yourself. And it's purple. All the coolest things are purple! Here's a successful formula we've seen before from Simon and Schuster - the brilliant "Jack's Mega Machines" stories by Alison Ritchie and Mike Byrne come with a brilliant pop-up cardboard model of the vehicle in the story. Now E.T. Harper and Dan Taylor's "Dylan's Amazing Dinosaurs" series are doing the same thing, introducing kids to various dinosaur species, starting with "the Daddeh!" - The Tyrannosaurus Rex. Dylan is the proud owner of a fossil journal, given to him by his grandad - and a magical model of a Pteranodon that comes to life and whisks Dylan away on adventures, to find out more about dinosaurs and help him complete his Grandad's fossil records. This is the first book in an eventual series and it's a real win for Charlotte who absolutely loves Dinosaurs, and really loved the "Jack's Mega Machines" collectable books and models. I do take issue with the fact that there has been a lot of furore over books targeted largely at girls when this is very boy-centric (even the back cover features two boys playing with the model rather than a boy and a girl). 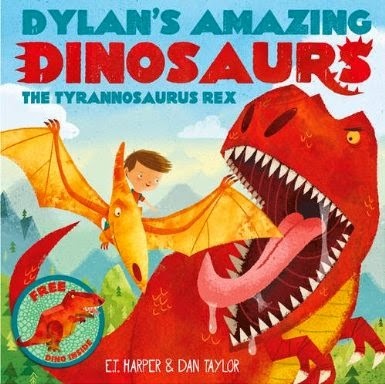 Girls think that dinosaurs rock too, particularly my little girl, so if you're looking for an exciting story, with a cool model to play with, and an ultra-colourful and brilliantly presented story you're onto a winner with Dylan! Charlotte's best bit: Dylan in the sinking bog. Phew-eee! Daddy's Favourite bit: A nice idea to produce more books with these excellent fold-out models. Great for boys but equally good for dino-loving girls too! Introducing Maisie Hitchins - Girl Detective! 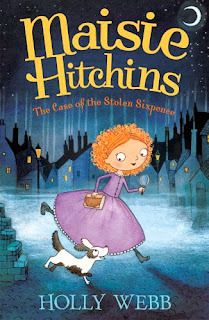 Holly Webb's gorgeous snowy stories have become well-loved books for us, but when we found out that Holly had been burning the pencil at both ends to write a fantastic series of books based on a victorian girl detective, we couldn't resist finding out more. Meet Maisie Hitchins, a plucky girl with flame red hair and green eyes, who is curious and inquisitive. Along with her sidekick Eddie (a rather frenetic and energetic little dog) they embark on a series of adventures and mysteries - starting with the first book in the series, "The Case of the Stolen Sixpence"
Today is publishing day for book one, but we've been fortunate enough to take a look at two more books in the series too! One of the things we find hard is to find really great books that have adventure, excitement and mystery in them - but have strong 'girl' appeal. 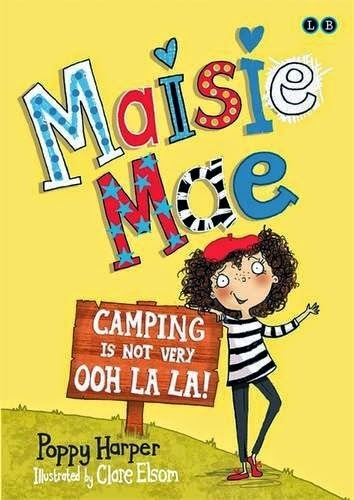 Though the Maisie Hitchins books work equally well for girls and boys, it's a series that has instantly caught Charlotte's attention (and will probably fill our bedtime reading slot for quite some time to come!) 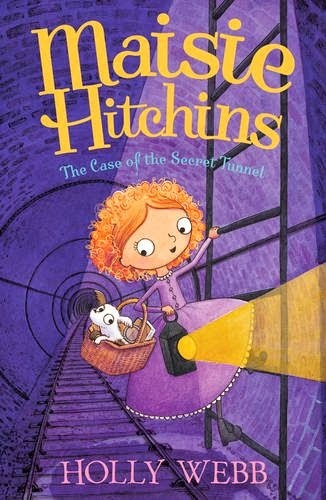 A perfect combination of setting (Anything "Victorian" is always a huge hit with Charlotte), an air of mystery and supernatural suspense, and more than a nod to fabulous detective mysteries like Sherlock Holmes make this a truly unmissable series for our very own little girl detective! Fantastic covers and illustrations by Marion Lindsay (we love love LOVE the house drawing at the start of each tale) really make this series a brilliant transition for children who are moving on from picture books into early chapter readers. 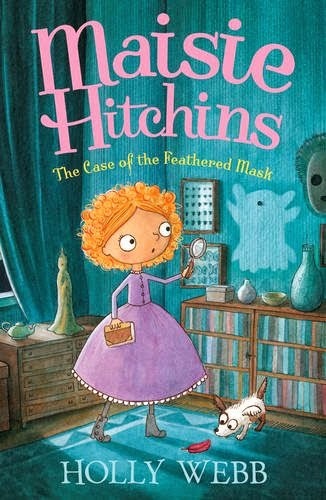 Two more books in the Maisie Hitchins series, "The Case of the Missing Emerald" and "The Case of the Phantom Cat" will closely follow. We'll be catching up with Holly really soon on the blog and will keep you up to date with all things Maisie, rest assured! 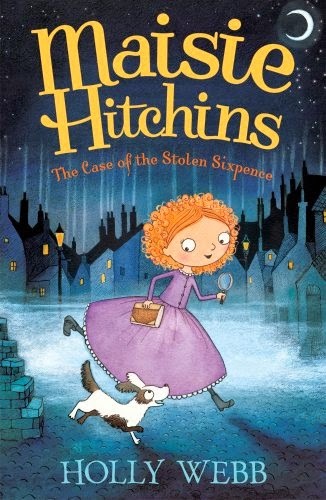 Charlotte's best bit: So far we're reading through "The Case of the Stolen Sixpence" and it's instantly grabbed Charlotte's attention and peaked her curiosity. Fabulous stuff! Daddy's Favourite bit: A fantastic character, a brilliant setting, tons of atmosphere and suspense, Maisie is set to become an instant hit with girls and boys who love a detective mystery or two. Kids love to cook, and kids particularly love to cook anything that's a break from the norm. 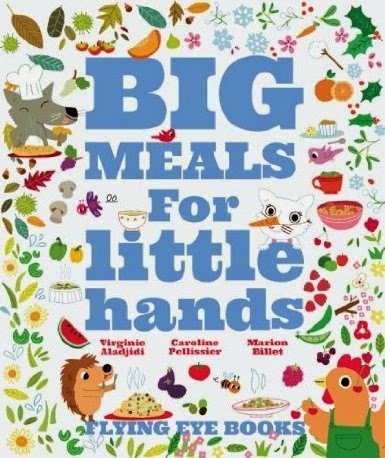 Most of all, kids love cook books that are designed for them to use - with a little help from mum and dad, and that's precisely what "Big Meals for Little Hands" delivers. With a soupçon of french cuisine, and some truly interesting ideas, this child-friendly cookbook looks as delicious as the recipes it imparts. Gorgeous illustrations and engaging characters guide young hands and adult helpers through each recipe, from amazing soups to scrummy salads. 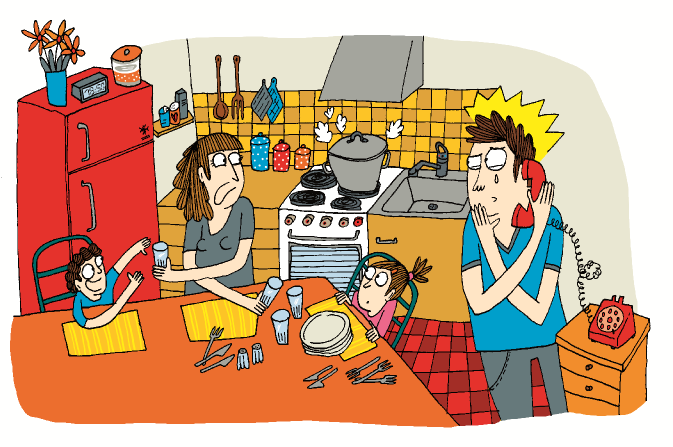 Who knows, it might even get your children trying new and exciting foods that normally they'd turn their nose up at! 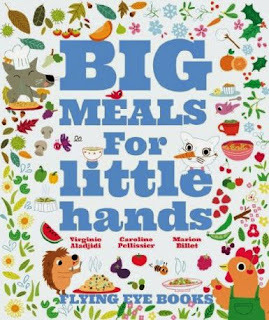 "Big Meals for Little Hands" is out on 15th May. Our tummies are already rumbling in anticipation! Daddy's Favourite bit: Flying Eye's drop-dead-gorgeous presentation, in a kid-friendly cookbook you're sure to return to again and again. C'est magnifique! It's 2014 and World Cup anticipation will reach fever pitch. 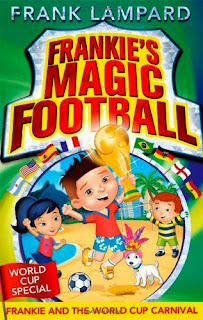 Naturally the world's football heroes are getting quite excited about the tournament, particularly Frankie in his latest adventure "Frankie's Magic Football: Frankie and the World Cup Carnival". After some spirited high-jinks, Frankie ends up slicing the perfect kick - straight into the family's television set after Frankie's rotten brother taunts him during a garden kickabout. Calamity! But before he can try and undo the damage, Frankie and his team are whisked off to Brazil to find three magical items that could help England win the world cup. Trudging through squidgy swamps, and facing off against an uber-talented team of brazilian street soccer experts and a toothy referee with a serious overbite, it could be Frankie's toughest challenge yet. "Frankie's Magic Football: Frankie and the World Cup Carnival" arrives on May 1st 2014. 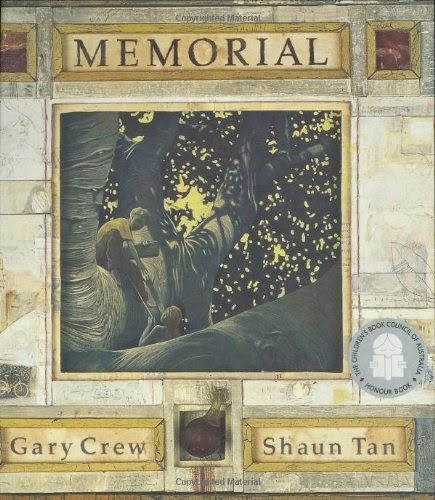 First published some years ago now, in this centenary year of the outbreak of World War 1 a reprint of Gary Crew and Shaun Tan's superb "Memorial" is a genius move by Hodder. This paperback version of the book tells the powerful story of a tree, planted to celebrate the return of soldiers from the war. Recounted partially by the children of a WW1 veteran, and by conversations with 'Granpa' it builds an emotive and strong message that we should not forget those who fought and died for us in World War 1 and 2, and the multitude of conflicts around the world where brave men and women give up their lives to serve their country. Gary Crew and Shaun Tan work wonderfully together. More subtly tinged with a touch of the surreal than Tan's other work, he still produces the most beautiful ink and paint illustrations that lend this book gravitas and a fitting sense of honour and homage. 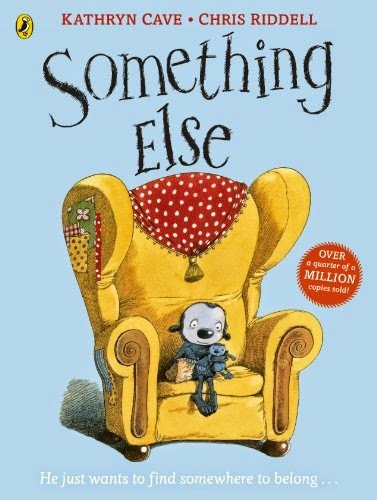 We have read several books that deal with this sensitive subject well, and this is definitely a book that would suit older children. That said, even a 6 year old could fully understand the message therein: That the modern world and the people in it often overlook the huge sacrifice made, and is it right and proper that a memorial to a long-forgotten war should be removed purely for convenience (as is the fate of the tree or the war memorial in this tale). I love how the grandson takes up the fight, on behalf of his grandma and grandpa, and their fallen comrades. This is strong stuff, serious stuff but deftly written and beautifully illustrated. Not to be missed if you haven't previously caught this wonderful book. Charlotte's best bit: Huge debate on the fate of the memorial tree in this book. Should they take down the tree or the monument? Goldilocks is one of Charlotte's favourite traditional stories. I think it's because Goldilocks is a bit of a subversive devil-may-care character who is a little naughty, and gets away with it too (depending on which version of the story you read). 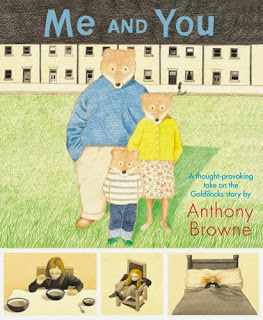 When you hear that Anthony Browne has reworked the story and given it a poignant contemporary message, you sit up and take notice. Not just because Anthony Browne's artwork can sometimes carry some of his less impactive books, but because he is a writer who can truly deliver on a promise like that. So Goldilocks in "Me and You" isn't really a character from the wrong side of the tracks, she's not really naughty either - Goldilocks here is a poor girl separated from her mother during a trip to town, whose curiosity leads her to the bear's house. The 3 bears in the story seem to have a privileged life, comfy surroundings, a house full of light and colour and plenty of food on the table. This is definitely not the impression you get about Goldilocks' home life at all. The beauty of this book is that the story unfolds largely thanks to the reader. Your interpretation of what you're seeing, and your interpretation of what you're reading (and reading into Anthony Browne's subtle theme woven between the threads of the traditional story) is so utterly clever and thumbs the heartstrings rather beautifully. Not least of all when the story reaches a climax that wasn't in the original, but works absolutely perfectly. This book is a few years old now but it so deserves a lot more attention. If you think you've read every single take there is on Goldilocks, make room for one more, this is superb. Daddy's Favourite bit: One of the best retellings of Goldilocks, proving that Anthony Browne engages and works with the reader in such subtle and wonderful ways. An important book this, and it so deserved a lot more attention. Go find it in your library or pick up a copy if you can.